Recent advances in macular hole surgery have significantly improved the rates of anatomical success. One important advance is the dye-assisted peeling of the internal limiting membrane (ILM) around the hole. Two recent meta-analyses have shown the superiority of peeling the ILM over nonpeeling in achieving primary anatomic closure., In large holes (<400 μ), sometimes, ILM peeling alone is not enough to achieve closure, and this may be improved by inverting part of the peeled membrane and using it to cover the macular hole or inverting and tucking the ILM flap into the hole. The inverted ILM may serve as a scaffold for cellular proliferation, thereby increasing the binding forces that hold the separated fovea margins together. This case presentation suggests that these adhesive forces appear to be strong enough to maintain structural integrity of the closed hole even in the presence of a macula-involving retinal detachment with large subretinal fluid collection, in which case the retina becomes mobile. A 59-year-old female was referred to the retina clinic with painless progressive loss of vision in her right eye of over a 2-year duration. She had no history of spectacle wear, and her general medical history was unremarkable. Her best-corrected visual acuity (BCVA) was 6/36 in the right eye and 6/9 + 3 in the left eye with bilateral cortical lens opacities. Her fundus evaluation revealed a full thickness macular hole in the right eye with central lipofuscin dots and a partial posterior vitreous detachment. The optic disc was healthy and intraocular pressure was 12 mmHg. The fellow eye was unremarkable on examination. A diagnosis of the right eye full thickness stage 3 macular hole [Figure 1] was made, and she was scheduled for macular hole repair using the inverted ILM flap technique. The Constellation (Alcon) 23-gauge vitrectomy system was used. A pars plana triamcinolone-assisted vitrectomy with vitreous base shaving was performed. ILM peeling was done after staining with Duoblue (0.075% trypan blue/0.075% Brilliant Blue), Southern Medical Ltd. Peeling was extended to at least 2 DDs from the center of the fovea, but the area of the papillomacular bundle was spared to serve as a hinge and prevent dislocation of the ILM flap. The flap created was trimmed using near-zero aspiration. After an air-fluid exchange, the remnants of the ILM were manually inverted using an ILM forceps and tucked into the macular hole to cover it. Further aspiration of vitreous cavity fluid over the optic disc was done using a low suction, while ensuring that the ILM flap stayed within the hole. This represents the inverted ILM flap technique that was performed. Endolaser application to a small horseshoe tear identified in the superotemporal location was done after careful trimming of all the vitreous around the break. Surgery was completed with silicone oil injection to provide adequate endotamponade. Silicone oil was preferred as the patient could not adopt face-down position and had to return to work. Postoperative optical coherence tomography (OCT) showed good hole closure with ILM flap with the macular hole. She was scheduled to have phacoemulsification at the time of silicone oil removal. During the subsequent follow-ups, her BCVA stabilized to 6/36 in the 2nd month, but decreased later to 6/60 due to a worsening cataract in the operated eye. She underwent phacoemulsification with silicone oil removal in the 4th month. Two months postcataract surgery and oil removal, her vision had not improved beyond 6/60. Fundus examination revealed a macula-off retinal detachment originating from the previously treated superotemporal tear, which had now reopened. The repaired macular hole, however, remained closed despite the presence of significant subretinal fluid under the foveomacular area; this was confirmed on a subsequent OCT. 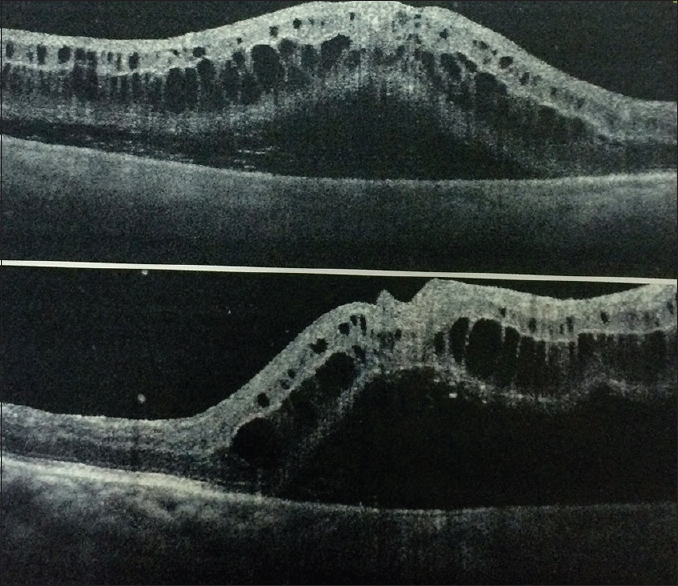 There was significant macular edema represented by large cystic spaces in the outer retina layer as well as cysts in the outer aspect of the piece of ILM tissue due to the accumulated subretinal fluid [Figure 2]. Retinal detachment is one of the known complications of macular hole surgery. The EVRS Macular Hole Study, involving a review of 4207 cases, reported 3.6% as undergoing subsequent retinal detachment surgery. Retinal tears are noted as the risk factor and approximately 0.035% had a tear as an intraoperative complication. There are not many reports in the published literature on the behavior of repaired macular holes in the setting of macular-off rhegmatogenous retinal detachment. This is likely because majority of surgeons now inspect the retinal periphery for breaks, thereby allowing potential risks for retinal detachment to be identified and managed before finishing the surgical procedure. In this case, the identified break was adequately treated with endolaser, but notwithstanding, this led to a detachment after removal of the silicone oil. Not much is known about the stability of the closed macular hole when there is a pool of subretinal fluid under it. Nor is there any study or report on the strength of the adhesion between the fovea edges or between the inverted ILM and fovea edges. This report provides some useful suggestion that the strength of adhesion between retina and inverted ILM flap can be strong enough to resist giving way and reopening in the setting of a mobile retina. The inverted ILM which bridges the edges of the macular hole over time binds to the edges of the retinal tissue by forces likely to involve Muller cells' migration and glial tissue processes. The ILM binding force to the retinal tissue is significant as it prevents dislocation of the ILM tissue even in a mobile retinal state as seen when subretinal fluid accumulates under the fovea in a retinal detachment. The significance of understanding the forces holding or binding the edges of a repaired macular hole together comes to bear when considering cases of reopened macular holes after initial successful repair. Reopened macular holes often require further surgical intervention and determining ways to strengthen the tissue adhesion and prevent reopening will be a desirable a desirable goal. Further research into the adhesive forces at play in the foveomacular after macular hole surgery is required. Spiteri Cornish K, Lois N, Scott NW, Burr J, Cook J, Boachie C, et al. Vitrectomy with internal limiting membrane peeling versus no peeling for idiopathic full-thickness macular hole. Ophthalmology 2014;121:649-55. Gao X, Guo J, Meng X, Wang J, Peng X, Ikuno Y, et al. Ameta-analysis of vitrectomy with or without internal limiting membrane peeling for macular hole retinal detachment in the highly myopic eyes. BMC Ophthalmol 2016;16:87. Michalewska Z, Michalewski J, Adelman RA, Nawrocki J. Inverted internal limiting membrane flap technique for large macular holes. Ophthalmology 2010;117:2018-25. Adelman R, Parolini B, Michalewska Z, Ducournaus D. The European vitreoretina society macular hole study group. Invest Ophthalmol Vis Sci 2014;55:314. Mahalingam P, Sambhav K. Surgical outcomes of inverted internal limiting membrane flap technique for large macular hole. Indian J Ophthalmol 2013;61:601-3.